What is it about our many legged friends that makes them a popular trope in Steampunk? ۞ Monster Cephlapods have been the major focus of several classic works of Science Fiction and Fantasy such as H. P. Lovecraft’s The Call of Cthulu, Jules Verne’s 20,000 Leagues Under the Sea and the 1830 Tennyson poem The Kraken. There is also a Sir Arthur Conan Doyle story called Horror of the Heights that features a flying tentacled monster. In more recent times both the Kraken and Cthulu-like monsters have made appearances in Hollywood blockbusters like Hellboy and Pirates of the Caribbean: Dead Man’s Chest (though you also get a good look at the Kraken after it is death in Pirates of the Caribbean: World’s End). ۞ Their bodies are also reminiscent of complex machines. The long skinny tentacles are like wires or tubes and their movement is powered by water, not unlike steam vehicles. As a bonus their bodies kind of look like they are wearing a helmet and goggles all the time, and if Steampunk had an official symbol I’m pretty sure it would be a pair of goggles (or maybe a gear). Cephlapods are fascinating creatures that are about as far away from human as you can get. ۞ I used to work at an aquarium so I got a chance to spend lots of time observing octopus and my personal favorite cuttlefish. These invertebrates can move in three dimensions, jetting around the water column and feeding on smaller animals. They are also totally visually stunning. Undulating tentacles aside, many of them can change color and shape at will, which makes them masters of disguise. Want to have your mind blown? Check out the PBS documentary below for more information about cuttlefish camouflage. 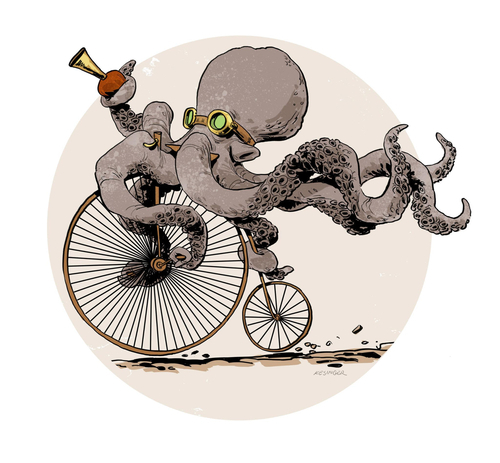 I’ve collected just a sampling of the Steampunk art featuring our many-legged friends out there on the interwebs. In most cases you can get the artist’s name by simply hovering over each image and you can open a gallery of larger images by clicking on any thumbnail. If you see something that is mislabeled or you know who is behind one of my unlabeled entries please let me know so I can give the artist the credit s/he deserves. Click on any thumbnail to open the gallery of larger images. This entry was posted on January 16, 2014 by Phoebe Darqueling. It was filed under Artwork, Books, Graphic Novels and Adaptations, Movies and Television, Steampunk You Can Wear and was tagged with Brian Kesinger, H. G. Wells, H. P. Lovecraft, Hellboy, Jules Verne, Neo-Victorian, Pirates of the Caribbean, steam punk, Steampunk, steampunk animal, steampunk art, steampunk blog, steampunk books, steampunk clothes, steampunk fashion, steampunk octopus.